The plasma-products maker rejected two buyout offers, including one worth $3.9 bln led by its former boss, in favour of a dilutive share sale at a discount to both. Investors are stuck with fuzzy maths and poor governance that show why China Biologic would be better off private. 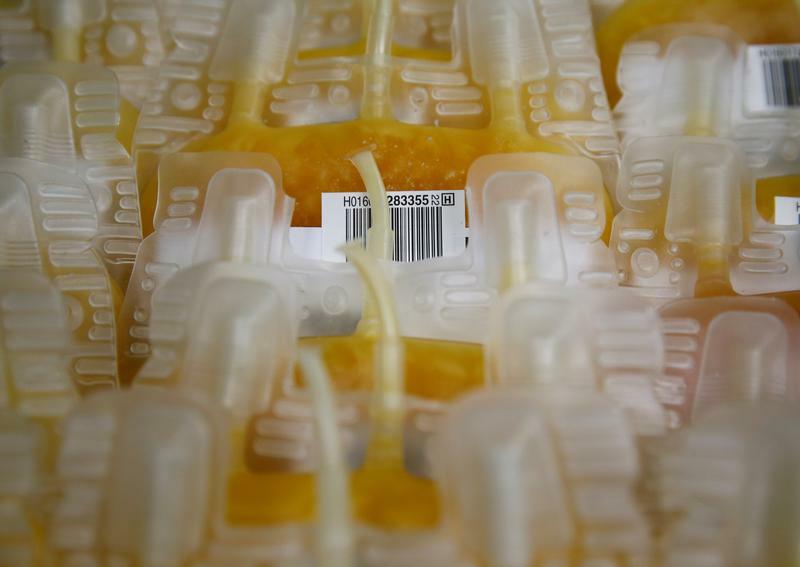 Frozen plasma bags, taken from blood donations, are pictured at the Interregional Transfusion CRS in Bern, Switzerland, June 15, 2017. China Biologic Products said on Aug. 24 it had rejected a $3.9 billion takeover bid led by its former chief executive and instead will issue shares to a group of other investors including rival suitor CITIC Capital at a lower price. The U.S.-listed company’s stock price fell about 16 percent the same day, to close at $84.91. Centurium Capital, a fund linked to China Biologic Chairman David Li, CITIC, Hillhouse Capital and PW Medtech have agreed to buy 5.9 million shares, representing about 15 percent of the enlarged share capital, for $100.90 apiece. Following the transaction, the group will own a combined 37.3 percent of China Biologic. The group led by former CEO David Gao offered to buy the company for $118 a share, while CITIC had previously offered $110 a share.